Billy Joe Saunders: I'm The Best at 160 and 168 in The World! 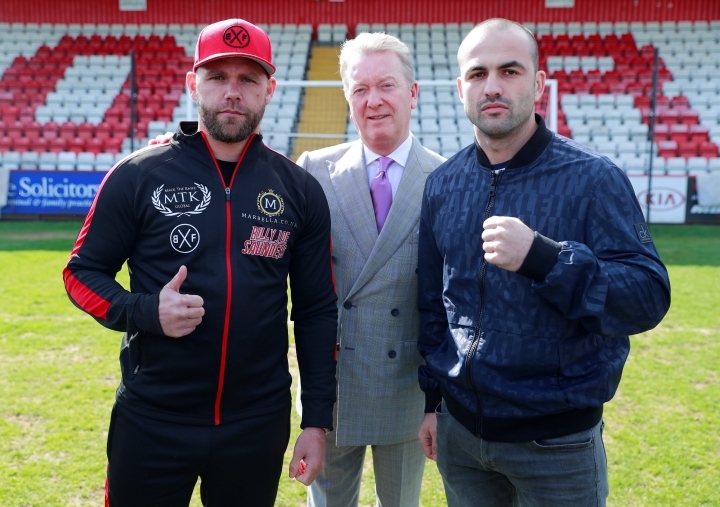 Saunders (27-0) will be closing in on becoming a two-weight world champion after his unbeaten reign as WBO middleweight champion when he faces Isufi on Frank Warren’s ‘King Of Herts’ bill at the Hertfordshire stadium close to his Hatfield home. Munich based Albanian Isufi (27-3-2) is on a ten fight winning streak, the current WBO intercontinental champion and the number one contender for the WBO title, held by Mexican Gilberto Ramirez. “This is a good homecoming, but a bit of pressure because I have never boxed so close to home. I’ve got to make sure I’m on my game because Isufi is looking to take my head off. My mind has got to be focused and set new challenges." "I love the Ingle gym and loved working with Dominic Ingle and there are no hard feelings - he may even be in the corner with Ben. There is unfinished business in me and people haven’t seen the best." "I have never been more determined and I have a lot to prove this year. I had a terrible 2018 inside and outside the ring and I know I have to be on top flight for Isufi." "Billy can have a million people cheering him on, there’s only going to be two of us in that ring on fight night. I will give Billy Joe a very tough night." "Billy is very good fighter, very fast and quick and a good puncher but I am very confident I will give him a tough time." Stop. He may have the best resume ever in the sport for defeating gatekeepers. If thats what he means, yeah he is legit.